The Indian Defence Acquisitions Council (DAC), chaired by India’s Defence Minister Manohar Parrikar, has pre-approved an armaments modernization project for the Indian armed forces for a total sum of 821 billion rupees (over $ 12 billion), the Times of India (TOI) reported. According to the report in the TOI, what has been approved is the purchase of 83 fourth-generation Indian light multipurpose fighter aircraft Tejas Mark-1A and 464 Russian T-90 tanks, and 6 additional regiments of the Indian MRLS ‘Pinaka’. India plans to set up a licensed assembly plant for the armoured forces through the Ministry of Defence Ordnance Factory Board. The DAC’s approval is the penultimate barrier before the signing of the world’s largest tank contract over the past 15 years, without any exaggeration, Andrey Frolov, editor in chief of the magazine Arms Export, told Gazeta.ru. “This confirms Russia’s place in the global market as the largest developer, manufacturer and supplier of armoured vehicles. The T-90MS will allow Uralvagonzavod (UVZ) to reach a higher level of production, while keeping all the features of earlier T-90 tanks,” said Frolov. Frolov said that earlier, Indians did not fully realize the potential of the licensed assembly of Russian tanks, even though they already have such an experience. “Some things will be made in UVZ and others in India. In any event, both for the domestic producers, as well as for the Indian party, it would be an advantageous contract”, said a source of Gazeta.ru. On the eve of the Defexpo 2016 India arms exhibition in March, Oleg Siyenko, the CEO of the UVZ Corporation, outlined in an interview with Gazeta.ru, Uralvagonzavod’s plans to modernize the T-90 and T-72 Indian tanks. UVZ’s cooperation with India began in 1978, with the delivery of T-72 tanks. Later, UVZ specialists helped in rebuilding the tank factory at Avadi to facilitate the licensed production of T-72 tanks. The latest stage of cooperation started in 2001, when the first contract for the supply of T-90S tanks to India was signed. Currently, India is implementing a programme for licensed production of the T-90 ‘Bhishma,’ and various after sales service projects of armoured vehicles, including spare parts and engines. In response to an Indian request, UVZ offered individual modernization options for T-72 tanks, and for modernization of the T-90S. Siyenko said the Indian army plans to stop commissioning T-72 tanks in 2025-2030 and replace them with the average main battle tanks of the future. The project is known in India as the FRCV (Future Ready Combat Vehicle). The Russian T-90MS (upgraded T-90S) meets all parameters and could come under the new Indian tank fleet upgrade, said the UVZ CEO. “I personally observed great interest, among the senior Indian military men, in the T-90MS tank at the Russian Arms Expo (RAE) exhibition in Nizhny Tagil”, said Viktor Murakhovski, chief editor of Arsenal Otechestva (Russian military review – translator’s note). The ‘Tagil’ exhibition demonstrated combat techniques in action as part of military formations, and almost at the same site, next to the static display.”If we receive a request from the Indian partners to test the upgraded T-90S, Uralvagonzavod will be ready to send it to the test”, said Siyenko. “The Indians were really convinced of the high combat capabilities of the T-90MS, compared with the T-90 machine, which is available in service in India. T-90MS is definitely an entrance to a new level. And since this vehicle has new ammunition, we can say a new weapons system,” explained Murakhovski. The expert said Pakistan would purchase armoured vehicles from China soon. Chinese armed forces demonstrated their model of the new VT-5 tank at the November Airshow China 2016. “India is therefore concerned about maintaining the military and technical superiority in the field of armoured vehicles. However, it would be rash to expect that the contract will be signed as early as tomorrow. In India, such things are not done quickly”, said Murakhovski. The T-90 went through baptism of fire in Syria in the spring of 2016. The first reports of the Syrian army receiving mechanized divisions of the Russian T-90 appeared November 29, 2015. On February 5, sources of RNS agency in the Russian Ministry of Defence explained that, at the end of 2015, a large consignment of Russian T-90A tanks, which had previously operated in the Russian army, were delivered in Syria. Syrian tank crews even trained on the Russian sites. According to the agency, the T-90A tanks were first used by the Syrian army near the city of Aleppo, ensuring protection of the Syrian army assault groups. The T-90 battle tank, built from 1980-1990 on the base of the T-72B, was named ‘Vladimir’ in honour of head designer Vladimir Potkin. 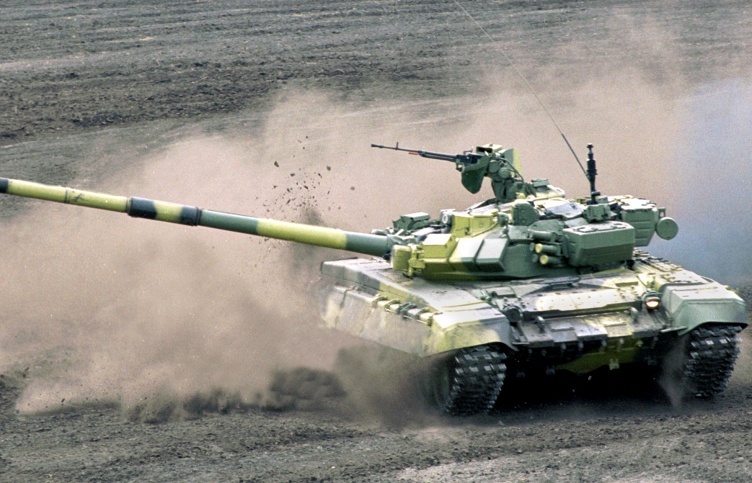 The T-90MS is a modernized version of the tank’s export model, named ‘Tagil’. It is equipped with a 125-mm smoothbore gun – 2A46M-5 launcher, guided by missiles with laser-guided sight with thermal imager. The maximum sighting range of the armour-piercing shells is 4,000 m, and high-explosive shells – up to 9,600 m. The maximum range of the direct shot at the target height of 2 m. is 2120 m. The tank is also protected with dynamic protection against chemical and armour-piercing shells. At the customer’s request, the active protection Arena-E system to combat anti-tank guided missiles can be installed in the T-90MS.Yeni Safak, Turkey’s pro-government newspaper and the Iranian news agency Fars reported that the T-90A was involved in attacks on militants. Online videos, posted by the Syrian SANA agency where these machines are shown, proved that Russian T-90As were used. October 19 – Russia’s T-72 and T-90 main battle tanks will be capable of destroying enemy armored vehicles with a single shot after they are equipped with the Armata tank’s ‘electronic brain’, according to the Russian newspaper Izvestia. The newspaper Izvestia quoted a Russian Defense Ministry source as saying that the Russian main battle tanks T-72 and T-90 will soon be equipped with the automat…ic target tracking system and computer unit used in the advanced Russian tank T-14 Armata; it will enable the T-72 and the T-90 to destroy enemy armored vehicles with the first shot. “We plan start to test the modernized T-72 and T-90 in the next few years,” the source said, citing the current tests of the Armata tank’s automatic target tracking system. The source also pointed to the fact that all the three tanks are equipped with the same Kalina fire control system, which will simplify the process of installing the Armata tank’s electronic brain in the T-72 and the T-90. Izvestia also quoted military expert Alexey Khlopotov as saying that the use of the automatic target tracking system and the computer unit will help to significantly increase the efficiency of military hardware on the battlefield. “The main advantage of such systems is a complete exclusion of the human factor from the targeting process, which is especially important in stressful combat conditions. Each and every shot is on target; [the targeting system] becomes absolutely precise and is conducted much faster than when guided manually,” he said. Earlier this year, it was reported that Russia is planning to modernize its 150 T-72 main battle tanks to the T-72B3M version. The upgraded vehicles will be comparable to the more advanced T-90, but with much lower costs. Currently, there are 500 T-90A and T-90AM tanks in service with the Russian Armed Forces. However, the bulk of the Ground Forces rely on Soviet-era T-72 and its numerous modifications. Experts said that in order to upgrade its ground forces, Russia will modernize its ageing main battle tanks while working on the newest T-14 Armata. Russia will spend 2.5 billion rubles ($37 million) to upgrade 150 T-72Bs to the advanced B3M standard, Izvestia quoted Uralvagonzavod deputy director Alexey Zharich as saying in March 2016. Vietnam wants to buy Russia’s T-90 battle tank because it is more modern than its Western rivals, People’s Army of Vietnam colonel Nyugen Khak Ngyuety told Sputnik. Earlier this month the managing director of Russian machine-building company Uralvagonzavod told the Russian newspaper Izvestiya that the People’s Army of Vietnam (PAVN) is negotiating the purchase of up to 100 Russian T-90 tanks. PAVN colonel of armored troops Nyugen Khak Ngyuety told Sputnik that Hanoi turned to Russia because of its long history using Soviet-produced tanks. During its Resistance War against the US in the 1960s and 70s, Vietnam was armed with Soviet T-54 battle tanks and light amphibious PT-59 tanks, as well as Chinese copies of the T-54. These tanks were particularly valuable during the 1975 battle for Ho Chi Minh, and their speed, maneuverability and firepower enabled the Vietcong forces to move quickly and ensured the capitulation of the South Vietnamese army, Ngyuety said. “It was also inferior to the Soviet tank in cross-country performance and fuel distance. Another advantage of Soviet tanks was that technically they were much simpler than the US tanks and therefore more reliable. In the case of a breakdown, the crew could repair the vehicle relatively quickly. Repairing an American tank was much more difficult,” Ngyuety explained. Production of the T-54 and T-55 battle tanks began at the end of World War Two. Over 100,000 of the tanks were produced for the Soviet army, its allies and the export market, making it the most-produced tank in military history. The colonel says that today’s Russian tanks, including the T-90 which Vietnam wants to buy, have the same enduring superiority over their US counterparts as the Soviet tanks did. The colonel said the purchase of the tanks is a reflection of Vietnamese military doctrine, which values tanks as a key component of strike capability along with its infantry. “Tank equipment continues to play an important role on the battlefield. Obviously, Vietnam should do it both ways: procure modern combat vehicles, and upgrade the ones it already has,” Ngyuety concluded. Russia’s T-90 third-generation main battle tank entered into service in 1993. It weighs 46 tons and is fitted with 125 mm 2A46 smoothbore cannon, which was also used in the widely-produced second-generation Soviet T-72 battle tank and the third-generation T-80 Soviet tank. Last month Russia’s Defense Ministry announced that the Russian army is to modernize several hundred T-90 battle tanks. The Syrian army once again deployed the Russian T-90 tanks against the terrorists in Aleppo Front in Northern Syria. “The deployment of the Russian T-90 tanks in the ongoing battles against the terrorist groups in Aleppo province has given the Arab country’s army the upper-hand in the war against the foreign-backed terrorists,” the army said. The Syrian army is using the T-90 tanks in its battles against the terrorists in Aleppo province for a third time in less than two months after it deployed them in Khan Touman in December. The T-90 tank and its outstanding capability to destroy incoming TOW and M79 missiles appears to be perfect for a theater of war like the one in Syria. In 4 and a half years of conflict, more than 9,000 BGM-71E3B TOW and M79 anti-tank systems have been introduced in the country. Their capability to easily penetrate T-55 and T-72 tanks is the main reason why the Syrian Arab Army has had so many problems gaining ground in Aleppo province prior to using T-90 tanks. The great advantage of the T-90MS is its reactive armor and defense systems. It comes equipped with reactive armor blocks like the Kontakt-5, and a system such as the Arena-3 that detects, intercepts and detonates missiles at a distance of 2-3 m from the target makes this tank unique and a much needed upgrade for the Syrian army’s capacity to achieve important victories on the ground. In December, a senior military analyst said that the Syrian army has benefitted remarkably from the Russian manufactured tanks. The analyst further added that the Free Syrian Army (FSA) militants have received TOW anti-tank missiles, and the army could no longer use armored vehicles without advanced explosive reactive armor (ERA). “Using the advantage of T-90 tanks, the Syrian Armed Forces and their allies have surrounded the important towns of Khan Touman and Al-Qarassi near the Aleppo-Damascus Highway,” he went on to say. The Syrian army troops, the NDF, Kata’eb Hezbollah, (Iraqi paramilitary) and Harakat al-Nujaba (Iraqi paramilitary), that launched a joint operation in the Aleppo province’s Northern battlefield on Monday morning, have thus far captured the villages of Hardatnin, Doweir al-Zaytoun and Tal Jabin North of Bashkoy and have now deployed their forces only four kilometers from the entrances of Nubl and al-Zahra. The Syrian pro-government forces have at least advanced against the militant groups over three kilometers and have decreased their distance to the Nubl and al-Zahra from seven kilometers to four kilometers. The brand-new Russian T-90 ‘Vladimir’ tank is on its first overseas military assignment, having joined in the battle to push back forces opposed to Syrian leader Bashar al-Assad from around the vital city of Aleppo. The T-90 tank, among the newest pieces of military hardware to enter into service with the Russian armed forces, is having a baptism by fire on battlefields in Syria. Turkish and Iranian media first reported the presence of Russian T-90 ‘Vladimir’ tanks in Syria, after which sources in the Russian Defence Ministry confirmed their presence. Syrian government troops are reported to have recaptured the towns of Nubul and al-Zahraa to the north of Aleppo. Their effort is to establish control over “the security zone” between the towns of Azaz and Jarabulus on the Syrian border. Iranian news agency Fars, meanwhile reported on February 2 that the Syrian army was using T-90 tanks near Aleppo. It said T-90 tanks had been deployed near the town of Khan Tuman to the south of Aleppo after the Syrian army recaptured it in December. “Capitalizing on the superiority offered by T-90 tanks, Syrian government troops and their allies encircled the important towns of Khan Tuman and al-Qarasi near the Aleppo-Damascus road,” a military source said. A joint offensive by the Syrian army, national self-defence forces and Iraqi servicemen began on 1st February, resulting in the liberation of the villages of Hardatnin, Duwayr al-Zaytoun and Tal al-Jabin. Russian news agency RNS on February 5 cited sources in the Russian Defence Ministry as saying that a large batch of Russian T-90A tanks, earlier in service with the Russian armed forces, had been delivered to Syria in late 2015. Syrian servicemen had received necessary training at Russian training ranges, the news agency said. It added that the T-90A tanks supplied to Syria were first used by the Syrian army near Aleppo, supporting the advance of the Syrian army’s assault groups, said RNS. The Russian T-90A tank, which entered into service in 2004, is an upgraded version of the T-90 model, known as ‘Vladimir,’ built in the 1980-90s on the base of the T-72B tank. It was named ‘Vladimir’ in honour of the tank’s chief designer, Vladimir Potkin. The T-90A’s distinctive features are its engine, the turret and thermal imaging equipment. The tank has third-generation explosive reactive armour, that ensures protection against the 120-mm М829А2 and DM43A1 high-velocity de-calibrated ammunition used by М1 Abrams and Leopard-2 tanks. First published in Russian in Gazeta.ru. The Thai authorities on Monday refuted media reports that Bangkok was planning to purchase Russian T-90 tanks, the country’s chief of staff spokesman said. In recent months, it has been reported in the media that Thailand is considering buying an unspecified number of Russian-made T-90 battle tanks. Over the weekend, reports again emerged of Thai plans to purchase Russian tanks as Thailand’s Deputy Prime Minister Prawit Wongsuwan, who also serves as the country’s defense minister, is expected to travel to Russia in the near future. “Contrary to the reports of some Thai media outlets, Thailand has no plans to purchase Russian tanks. The fact that the deputy prime minister might examine the tanks during his visit to Russia, does not mean that he is going to sign a contract for their purchase,” Col. Winthai Suwaree told reporters. According to media reports, Bangkok is also interested in procuring some Chinese tanks that are based on the Soviet-era T-72 tank design.In 2011, Thailand placed an order worth $240 million for the purchase of 49 T-84 tanks as well as auxiliary military equipment with the Ukrainian company Ukrspetsexport. However, by the end of 2015, only 10 tanks had been delivered to the Royal Thai Army, which has allegedly caused concern among senior officials. YEKATERINBURG, February 3. /TASS/. Russia’s Uralvagonzavod company is ready to organize in Iran licensed production of the T-90S gun launcher-armed tanks if restrictions on military-technical cooperation with that country are lifted, the corporation’s deputy director general Alexey Zharich said on Wednesday. Russia’s main battle gun launcher-armed tank T-90S is equipped with an automated fire control system. It is a light tank (46.5 tons) with a low profile, which increases its survivability. “Cooperation with Iran was suspended in accordance with the presidential decree “On measures to implement UN Security Council Resolution 1020 of June 9, 2010″. But if restrictions on military-technical cooperation with Iran are lifted, the corporation together with Rosoboronexport (arms exporting company) is ready to continue cooperation, in particular, on the licensed production of the T-90S tanks, modernization of the T-72S tanks and their production capacities,” Zharich said. On Tuesday, Commander of the Iranian Ground Forces Ahmad Reza Pourdastan said the country preferred not to purchase Russia’s T-90 tanks, but to establish their production in the country.